Yesterday I mentioned that I would share with you my machine applique tips, because quilters would write and ask about the stitches I use on my applique from time to time. Well, you probably won’t be all that impressed after I share with you my little secret! And really, it truly is no big patent-able idea! 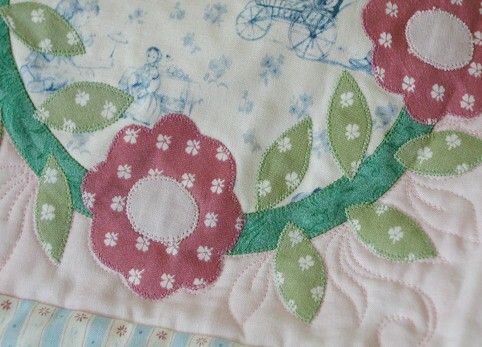 On my published quilts, my method of choice for applique is blanket stitched fusible applique. I set my blanket stitches teeny tiny in order to achieve the neat and tidy look. The stitch width and length are between 1.4-1.6 on my Bernina on the fabric. For fabrics that tend to fray easily, I use 1.6. Otherwise, I try to set my stitches as small as possible. I have also found that stitching with fine threads makes my stitches look better. I have used both YLI Silk 100 and Aurifil Mako 50 Cotton with very satisfactory results. 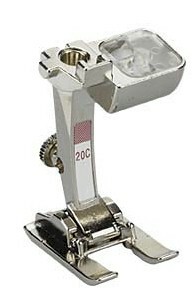 Joan asked about the foot I use – I almost exclusively use my 20C foot because its wide opening affords me the best visibility. I would imagine any foot you have that has a wide opening and can accommodate the widths of the blanket stitch would work. So, there you have it. My not-so-impressive secrets are out. Your thoughts (especially after you try my method)? This entry was posted in Freebies, Ideas, Tutorials, Quilting and tagged Buttonhole Stitches, Machine Applique Tips. Bookmark the permalink. Thanks for your tips. It looks great and I will give it a try. Wendy: Thank you so much for sharing. All your work looks so neat and very professional as always so now I must try to do this. I think I was using to heavy thread plus too long a stitches. Thanks a million. You are a motivator to me. I’ve been wondering what foot you use. Thank you for showing a picture of it. Thanks for the tips. I will use them on my next project. Could you recommend a brand of fusible web? 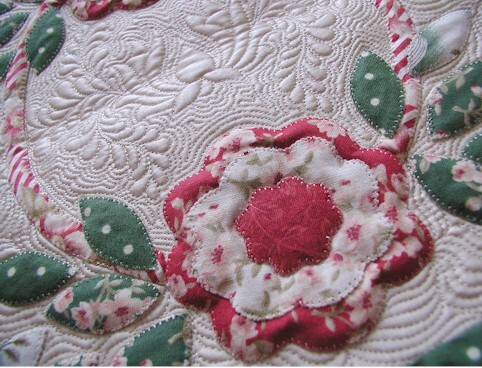 Would you be able to wash the quilts or is it more suitable for decorative wallhangings only. Your work is beautiful and I enjoy all your posts, thanks. OK. I just tried this, and I do like the unobtrusiveness of the tiny blankets. Have you used this stitching style on any quilts that get used and WASHED much? Does it hold up well? Or do the edges get really fuzzy after a couple of washes? 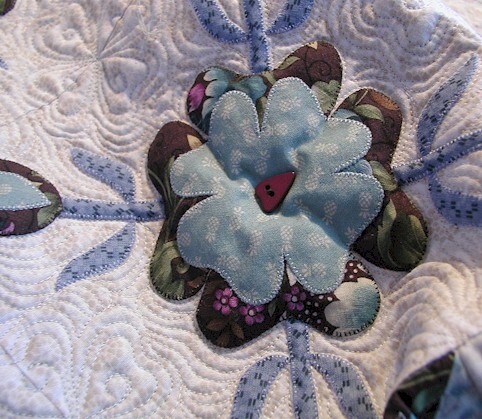 I am so happy to know that you use the same applique stitch that I do. I’ve experimented with other stitches and I always go back to the blanket stitch. Thank you so much for all the tips. You do beautiful work! Thanks for these tips. I’m anxious to try some of them as I usually don’t like fusing and blanket stitch. However, on your quilts they are beautiful and now I want to try it. I’m particularly interested in trying those different threads. Thanks again. The only tip or comment I would add is that being a Bernina user myself, whenever I machine applique I am sure to thread the bobbin thread through the “finger” of the bobbin case. That little extra step makes all the difference to achieve a thread tension that keeps the bobbin thread below the surface of the quilt. I love the precision and beauty of your stitches, Wendy! 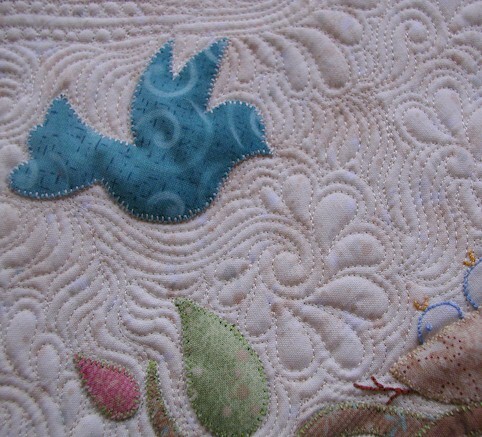 Your applique is as neat as your quilting. Thanks for the tips. This is the only type of applique I do – well, I also do blanket stitch by hand, I find it very soothing. I use my walking foot to do it on my machine, and machine embroidery thread. My favorite way to applique! Hi dear Wendy! Every time here there are something to learn! Great tips. 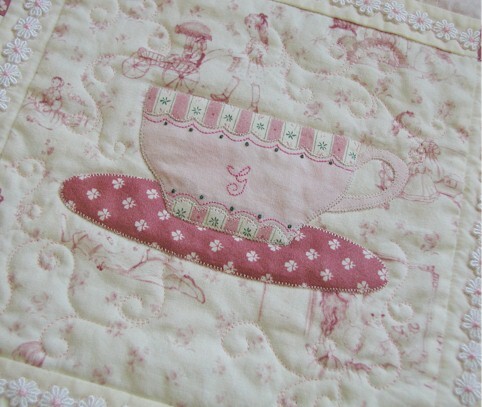 Pat Sloan is coming to our guild and she will be doing a workshop on machine applique so I will be giving it a try. Thank you for the tips! I have never went to that small of a blanket stitch. I will be trying it next time. I love your appliqued quilts. Beautiful! I usually do a satin stitch for my machine applique unless I’m going for a chunky buttonhole with black thread. But, yours looks so pretty, I’m definitely going to add it to my repetoire!! Thanks so much for the tutorial! I wish I had the steadiness of hand to do that kind of thing by machine. So pretty! You have the most amazing skill to be able to make such perfect stitches around all kinds of shapes! Thanks for the great tips. I will try this on my next applique project. Wendy, do you turn under the edges of your fabric before you stitch it down? It’s hard to tell in the pictures. I’ve done very limited machine applique but after seeing yours’, I’d like to give it a try. Hi Wendy! I´m spanish dealer of bernina, and I love them so much too. I love to make my works with bernina 440 and my 830. I use this stich so much. My last work made with ir was a Christmas quilt of Nina Halvorsen. It is so wonderful work! If you want to see it is in my blog. Thanks and bye! Thanks Wendy for both Tutes! where did you find the pattern for the teacup and saucer. that is just the cutest.. Your tips are very helpful, can’t wait to try this after Christmas. Do you use a stabilizer on the back? Thanks for sharing your tips….any suggestions on how to deal with curves and sharp points? Wendy, This is my first time on your page. Looking at you applique work it is beautiful. Thank you for sharing your work as not all of us can afford to pay for lessons. Thankyou Wendy for sharing with us. I have been fussing over learning how to applique, and your tips look like something I can handle. You inspire me to try more and more things with my quilting. I wish the best for you and yours to get better soon. Do you stabalize the fabric that you are sewing the applique on to? It depends on the weight of the fabrics I am working with – sometimes I do, sometimes I don’t. When I do, I either would use a thin iron-on fusible web, or just thin paper that I can easily tear away later. 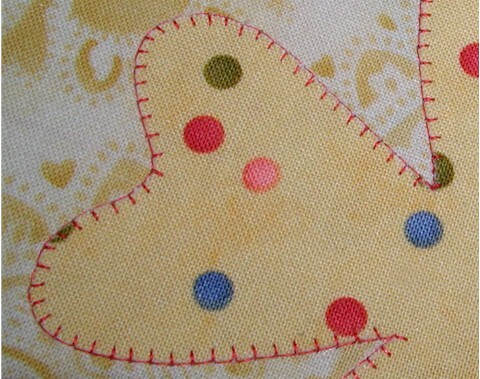 oh i love using blanket stitch on my applique, but since my machine does not have this stitch, i do it by hand. However, when i buy my next machine, i will make sure it has all the stitches i could possibly ever use! To conclude, i just wanted to say i really enjoy your stitches and all the pic and your notes are great for all of us! Thanks for sharing! Wendy, I love to use YLI 100wt for satin stitching, it lays flatter, will now try it for blanket stitch. I usually like a shorter stitch also but haven’t tried one as small as you mentioned. Your tips will probably help to like blanket stitch, it’s not my favorite. Thanks.